No primers, no staples, just apply. 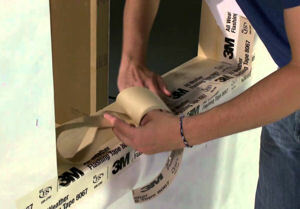 When placed around windows, doors, and other openings in wood frame construction, 3M 8067 saves you the time and effort of applying primers or staples commonly used to apply moisture-proofing membranes. 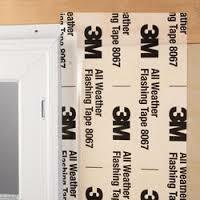 3M 8067 All Weather Flashing tape provides a weather resistant barrier around windows and doors. Prevents leaks around windors, doors, and joints. Cold temperature acrylic adhesive bonds on contact to a variety of materials at temperatures as low as -18°C without primers or staple. Roll is 6" x 75'. Works on cold and damp surfaces. Especially important given that job site conditions often mean less than perfect weather, temperatures and damp wood. Resists punctures and will self seal around nails and stapes. Conforms to irregular surface and contours for a tight seal, is thin enough to fit into corners and under siding. Split liner enables easier installations by allowing partial removals. UV-stabilized backing resists sunlight exposure for 60 days. It sticks to anything and provides a good watertight seal. It does not let water or air get through the siding or the roof. 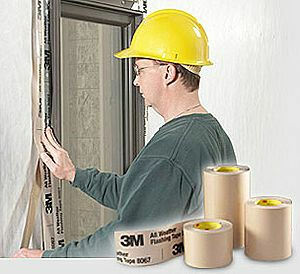 It is recommended when installing vinyl windows. It cuts easily, sticks to everything, OSB sheathing, as well as the house wrap. It has a little stretch which is good. 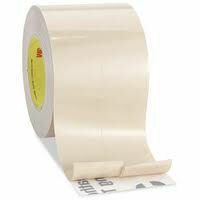 It is also cheaper than a lot of rubber adhesive flashing. 3M All Weather Flashing tape 8067 is the perfect solution for solving those critical flashing issues that often plague window and door installation as well as other flashing locations.